Kate: "Mom, which Beatle was your favorite?" Kate: "Why didn't you like George?" Mom: "He wasn't as cute and didn't say much." Kate: "You are so superficial!" Precious Georgie, whom I was told that James Burton said that he was 'kind'. What a nice description! I believe it. Also, I can NEVER hear enough of his version of "Here Comes the Sun" (which he wrote) so I am certain that this describes him perfectly... bless. And here's ole Paulie who ended up marrying Peg Leg Mills. Nice judge of character you've got there. Well I guess he's done some cool stuff too, but just doesn't compare to sweet Georgie. I'm with you. George had way more substance. 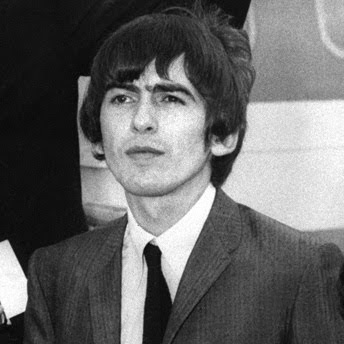 Maybe this blog was not intended for me, but I saw the pic of George and thought It had potential to interest me. Anyways, I have to say that John was by far the coolest of The Beatles. 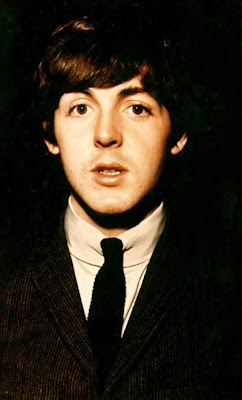 Paul was kind of a snob and you're right about George having substance or whatever. Poor Ringo never got his due. my moms favorite was george also, that makes me vote for him. Tired of Sleeping... is it possible?